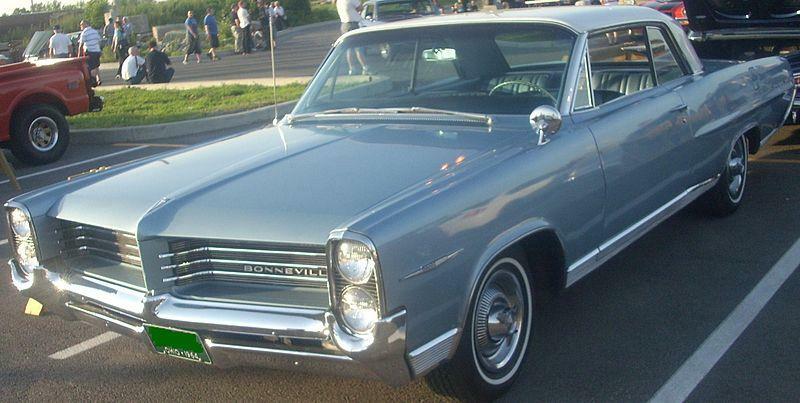 The top-of-the-line full-size Pontiac of the early 1960s was the Bonneville. These cars always received a more powerful engine than what was offered in the similar Star Chief, and where the Star Chief was available only as a 4-door sedan or hardtop, buyers in 1961 could order their Bonneville as a 2-door or 4-door hardtop, or a 2-door convertible. A 4-door station wagon was offered as a Bonneville Custom, but this model was based on Catalina underpinnings and had only the engine and interior in common. Like most cars of the early 1960s, the Bonneville had strong horizontal lines and no-nonsense bodywork. These cars were handsome, businesslike, and yet also looked capable of speed and handling. Power was provided with Pontiac’s 389-cid V-8, and a 4-barrel carburetor that boosted horsepower to 235—20 more than other Pontiacs. Bonnevilles with the Hydramatic automatic transmission received the same basic engine rated at 303 horsepower. Various other 389-cid options yielded up to 348 horsepower, while the performance 421-cid motor offered 405 horsepower. The 1962 Bonneville was essentially unchanged, but for 1963 the Bonneville switched to vertically stacked headlights along with the rest of the Pontiac lineup, excepting only the Tempest. Also in 1963, the Bonneville Custom wagon was dropped, but a Bonneville Safari 4-door station wagon was added, this time built on a true Bonneville chassis. For 1964, the Bonneville started towards the “coke bottle” styling that would define the brand for the next several years. Instead of the prior years’ straight lines, 1964 bodywork began to swell behind the doors and then swept back aft of the rear wheel wells in the manner of a Coca-Cola bottle laid on its side. Also, the 389-cid engine was raised to 255 horsepower, or 306 with the Hydramatic. The 421-cid option was still available at up to 370 horsepower. Collectors who want the straight line look can choose from any year from 1961-1963. Convertibles are most popular, followed by coupes. Four-speed manual transmission with floor shift was optional throughout this era, and is worth the higher price than the automatic or three-speed. For those who want the later 1960s muscle car look, the 1964 models with coke bottle curves delivers that visual aspect. Regardless of model year, there’s really no way to go wrong with a Pontiac Bonneville of this era.